Custom exhaust flanges for Chevrolet 3.6 Liter Alloytec LFX engines. 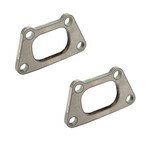 This pair of 3/8” thick exhaust flanges are made from mild steel and are designed for 2.5” tubing. Tubing not included.